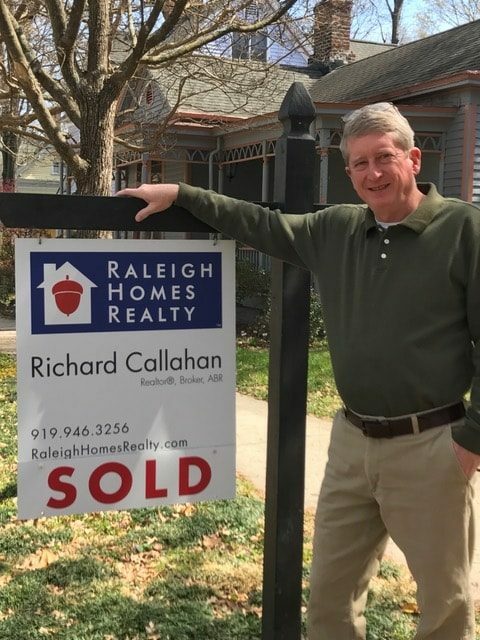 Richard Callahan is a full-service real estate broker and the owner of Raleigh Homes Realty, representing buyers and sellers in all parts of the Triangle area with every type of residential property. He is an Accredited Buyer’s Representative and has a special interest in historic homes, rehab properties, student housing, investment property, and downtown living. Richard grew up in Raleigh and has lived all over Wake County, from Cary to Holly Springs to North Raleigh, and has been living in Downtown Raleigh’s Historic Oakwood since 1997. Richard spent 29 years working for a local electroplating company, which served as a perfect springboard to his second career as a real estate broker, as he honed his negotiation skills through his work as a purchasing agent and also gained knowledge and experience in the building trades through his work in plant maintenance and construction. Richard understands what makes a well-built home. Richard provides exceptional customer service and enjoys helping people find just the right property. Let’s connect via social media channels.